Join Claire Vendetti, owner of Billie Claire Handmade, for an evening of hand lettering at Solid State Books! 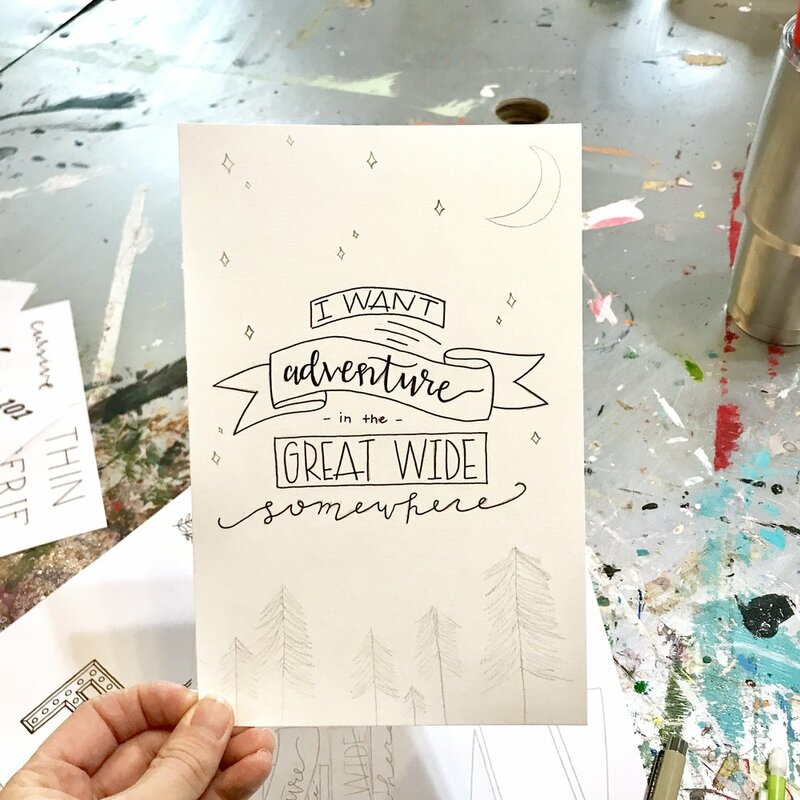 In this two hour workshop, you will tackle the two key ingredients to any hand lettered piece: the creative fonts used, and the composition of your layout. Once you have chosen your phrase, Claire will walk you through building a composition grid, shape, or free form flow for your lettering. From there, we will discuss three basic hand drawn fonts that can create a myriad of fancy letterforms - and you can use those basics to apply creative fonts to your piece. Lastly, we will tackle adding embellishments to your lettering to create a cohesive design. You will walk away with a finished hand lettered masterpiece, a selection of Claire's favorite illustration tools, and a packet of sample grids and shapes to use on your next project! This class is open to all skill levels - no prior hand lettering experience required. Your ticket purchase includes one free drink from the Solid State Books cafe - coffee, beer, or wine! Claire Vendetti, owner of Billie Claire Handmade, is an illustrator and digital artist, specializing in hand lettering, floral illustration, and graphic design. Her inspiration is driven by the places she's lived, her propensity for profanity, and her desire to connect with others on topics like mental health, body image, and being real. She has spent the last 10 years in Austin, Texas eating tacos and catching glimpses of armadillos and coyotes; and is thrilled to be a newbie to the D.C. area!